LIGONIER, Pa. (AP) — A pair of intricately decorated saddle pistols that once belonged to George Washington are to be displayed publicly today for the first time. The Richard King Mellon Foundation purchased the walnut and steel-carved saddle pistols anonymously at auction for about $2 million and gave them to Fort Ligonier in 2002. The pistols originally were given to Washington in 1778 by the Marquis de Lafayette, who bought them about three years earlier while serving in the French army. "When the public can see these things, they can appreciate the history of this country," Martin West, director of the Fort Ligonier Association, said Friday. He spoke as he donned a pair of white gloves and removed one of the pistols from a 150-year-old cherry wood box where it was nestled in faded orange velvet. Linda Ayers, director of collections at George Washington's Mount Vernon, said it's remarkable that the pistols will finally be on public view. "They are incredibly important treasures historically, especially because of the Washington-Lafayette relationship," Ayers said. The two men fought in battles together, and Lafayette later named his son George Washington Lafayette after his dear friend. The pistols, both18 inches long, have silver and gold inlay on engraved steel barrels that sit in intricately carved walnut stocks. Lafayette brought the pistols to America when he fought in the American Revolution. Historians say he gave the pistols to Washington as a sign of admiration and respect. Washington died in 1799. Twenty-five years later, his nephew's son-in-law, William Robinson, gave the gun to Andrew Jackson to commemorate his victory at the Battle of New Orleans. 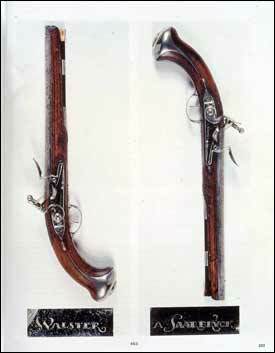 The pistols went back to France after Jackson's death in 1845, when he bequeathed them to George Washington Lafayette. For the next century and a half, the pistols would belong to a handful of private owners before being bought by the Richard King Mellon Foundation. Starting Sunday, the pistols will be on permanent display inside a glass case at the museum at Fort Ligonier. The fort was a supply depot and staging area for troops in 1758, and later was used as a garrison. The guns, along with original manuscripts Washington wrote about his experiences in the French and Indian War, are the centerpiece of an expanded permanent exhibit at the fort about Washington.